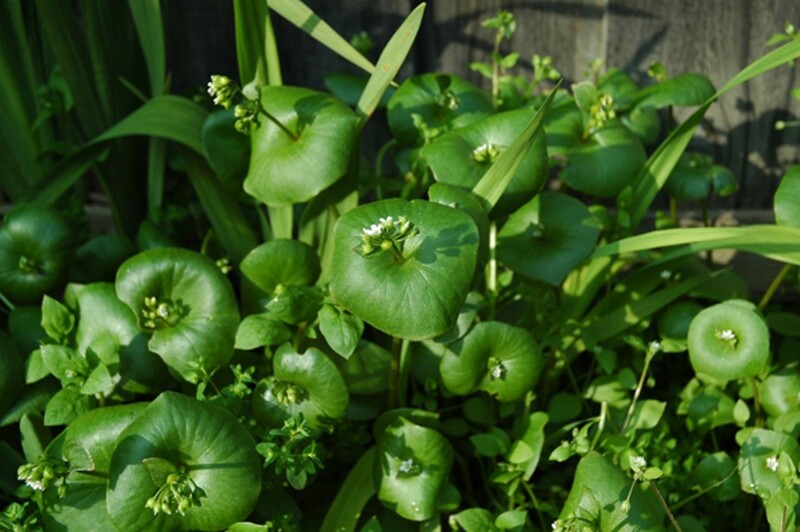 Miner's lettuce can be found in shady, coastal areas. Once upon a time, arugula was an unusual lettuce, found mainly in high-end restaurants. Now it's pre-washed at Trader Joe's. And nettles were scarce — but now they're practically at every farmers' market. Padrón peppers are as fashionable in some circles as Jimmy Choos are in others. These foods aren't new, and never were, but they once seemed new to us. And now there's a new wave of varieties being introduced — or re-introduced — to ravenous foodies by foragers, farmers, and chefs. Here's the leading edge of that wave. Jimmy Nardello Peppers: "Jimmy Nardello peppers are not new to the Chez [Panisse] world, but no one else knows what they are," said Jed Cote, head chef at Oakland's Boot and Shoe Service. "And they are so legit. They are so good. ... They're all I need in life." Though Full Belly Farm, located about two hours north of Oakland, has been growing them for about a dozen years, the Italian frying pepper has been gaining ground only recently. Like a cayenne, they're long and skinny and flaming-red. "You look at it and you think it's a pepper that's going to curl your toes, because it looks so hot and spicy," said Andrew Brait, a farmer and co-owner of Full Belly. "But, in fact, it's absolutely sweet." The pepper can be cooked or eaten raw. Brait found the peppers by requesting its seeds from the Seed Savers Exchange, whose members save and trade seeds amongst themselves. This was before the Exchange began to sell the pepper seeds commercially. "Their mission was to keep some kind of format for these traditional varieties from disappearing," he said. "We were in the middle of the heirloom tomato revival, if you will. So I thought, this is all part of that. The interest in heirloom vegetables is not just tomatoes, it can be other things, too." The peppers are named after Jimmy Nardello, who gave the seeds to the Exchange — his parents had brought them from Italy when they immigrated in 1887. "Obviously, they said, 'We're only bringing X number of things to the New World.' This pepper was one of the things that they chose to bring," said Brait. Cote said he prepares them on a grill or in a cast-iron pan. "All it needs is a drizzle of olive oil and some salt," he said. "It's a righteous vegetable because that's all you have to do to it. You don't process it in any way." The Jimmy Nardello pepper will begin to appear at farm stands like Full Belly Farm and Riverdog Farm, and on the summer menus of seasonally focused restaurants around the Bay Area, starting in mid-July. Highland Kale: Immigration also begins the story of highland kale. When Menkir Tamrat, a Bay Area entrepreneur from Ethiopia, lost his mother, he also lost access to the greens and peppers of his homeland. His desire to see them grown here led him to Fred Hempel, owner of Baia Nicchia Farm in Sunol. Highland kale is actually a mustard, but Hempel dubbed it a kale to distinguish it from his other mustards. Its stems are smudged with purple, and the bluish-green leaves are savory, almost meaty in flavor, with a slight mustardy bite. Unlike other kales, the leaves are tender. "A lot of times, with kale, you have to blanch it to tenderize it a little bit," said Executive Chef Matt Greco, of The Restaurant at Wente Vineyards. "With highland kale we just go from raw state into a sauté pan." The kale has found entry in local high-end restaurants, despite the fact that seasonally focused restaurants typically look to French and Italian sources for their cuisine. It used to be named "Ethiopian kale." "We now call it 'highland kale' because it's easier for chefs in French or Italian restaurants to put it on the menu, without having to have another country on the menu," said Hempel. But the flavors of the vegetables, and the open minds of chefs, are creating a place for these varieties. "Chefs are always looking for a new cut of meat, a new vegetable to use, and for the most part, it's all been done," said Greco. "Chefs are always looking for the newest heirloom variety that's really cool, and it just doesn't happen that often. So it's really exciting to discover something where you know, when it comes back around, you're going to use it the next season." Equally open-minded is Sean Baker, chef of Berkeley's Gather Restaurant. "Fred's an outside-the-box thinker, that's why we like to work with him." Baker recommends Hempel's frying pepper mix: a combination of Ethiopian mareko fana with the currently popular Spanish Padróns and Italian friggitellos. "It's a unique blend." Highland kale seeds will be available through Baia Nicchia's farm stand and online beginning in June, with the kale itself available in late summer. Miner's Lettuce: "Miner's' lettuce is finally catching on," said local foraging expert Kevin Feinstein. Iconic of foraging in California, it dresses dishes at Gather and Commis in Oakland. Any chef who seeks to create a sense of place on the plate might turn to the plant's beautiful round leaves, whose flowers are nestled at its center. It has a floral, grassy flavor, and a succulent quality, like mâche. Finding it at a farmers' market isn't easy. "Miner's lettuce is so delicate and expensive that it's not ideal for retail," said Bi-Rite Market's head produce buyer, Simon Richards. But it's free to pick in the nearby hills. "If you walk in the woods right now, it's everywhere," said Baker. "I really like the ones that are about the size of a dime." Joanne Krueger, whose Flatland Flower Farm is a principal source for miner's lettuce seedlings, pointed to the restaurant Noma in Denmark as setting the trend. "They do tons of local wild foods," she said. The foraging-focused restaurant has been ranked as the best restaurant in the world for the past two years by Restaurant magazine. Interestingly enough, what California grows without trying, other countries are cultivating. Denmark, Croatia, and Germany use miner's lettuce as a salad green. Meanwhile, agriculture in California continues to look outward, for the most part, for new types of foods. One local forager, Andrew Nimmo, asked, "What are we missing out on [that naturally grows] around here?" Perhaps these wild edibles: pine pollen, elderberries, bay nuts, manzanita berries, thistles, wild artichokes, and wild oats. "Next year, I'm going to turn people on to Siberian Elm samaras," said Feinstein. You can find miners' lettuce in shady, coastal areas, after the heavy spring rains, all the way through the summer. Bella Royale Peacotum: On the other side of the spectrum is the peacotum. A three-way cross between a peach, plum, and apricot, it's a completely new type of fruit. Last year, Blossom Bluff Orchards, south of Fresno, introduced one peacotum variety, the Bella Royale. Plum-shaped, but with the barest fuzz, the new fruit has a color that ranges from deep purple to lavender. Inside, the flesh is dense and golden. Response to the peacotum has been positive, and at the end of the season, Blossom Bluff had none left. Among its fans is Blue Chair Fruit founder Rachel Saunders. "The skin is delicious, and we thought it would make a great jam," she said. "It has a mellow, soft, beautiful flavor." Blue Chair's peacotum jam sold out. Saunders says she plans to make it again this year. Plant geneticist Floyd Zaiger is responsible for the new variety. 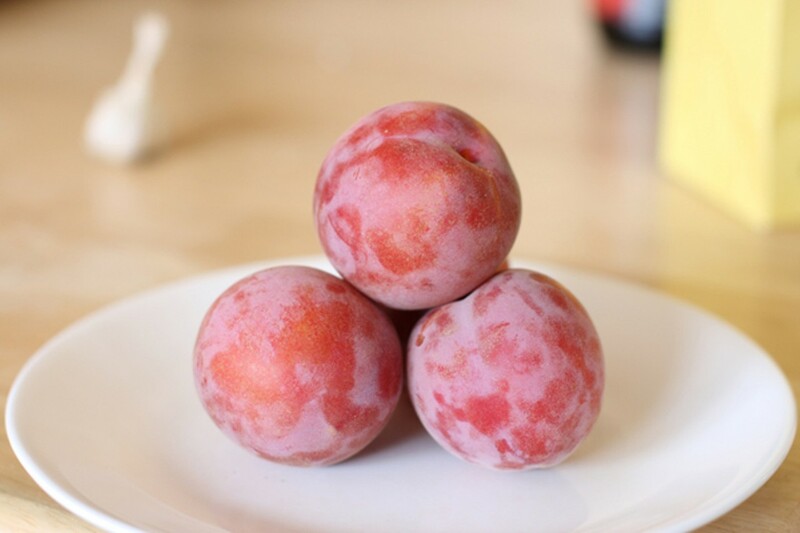 "[Zaiger]'s responsible for most of the amazing pluot varieties that have come out in the past twenty or thirty years," said Bryce Loewen, a farmer at Blossom Bluff. Expect the Bella Royale at farmers' markets and on dessert menus throughout the Bay Area in mid- to late-August. Blue Chair's Peacotum Jam will come out shortly thereafter.